Optical Properties of Functional Polymers and Nano Engineering Applications emphasizes the importance of nano engineering in improving the fundamental optical properties of the functional polymers, elaborating on high-level research while thoroughly explaining the underlying principles. Dr. Vaibhav Jain currently works in private industry and is a subject matter expert in materials science and engineering. Before that, he was a materials engineer in the Optical Sciences Division of the Naval Research Lab from 2011 to 2013. From 2009 to 2011, he worked in the same division as a National Research Council postdoctoral researcher. Dr. Jain received his Ph.D from Virginia Tech in macromolecular science and engineering in 2009, and his undergraduate degree in polymer science and chemical technology from Delhi College of Engineering, New Delhi, India. He has coauthored 35 publications and more than 50 conference presentations. Akshay Kokil is a materials scientist with diverse academic and industrial research experience. Dr. Kokil received his undergraduate education in polymer engineering at University of Pune, India, and earned his Ph.D in macromolecular science and engineering from Case Western Reserve University, Cleveland, Ohio, USA. He has authored more than 45 publications, and presented his research at multiple international research conferences. Several of his papers have been featured on journal covers and highlighted in research sections of magazines and websites. He is also the author of the book Conjugated Polymer Networks: Synthesis and Properties. 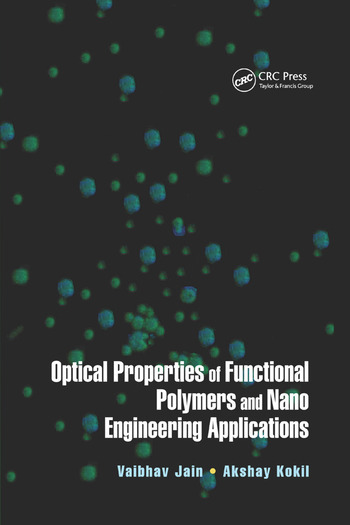 "This book is for researchers and polymer scientists who either develop or use polymers for optical sensing. It provides good technical depth and interesting applications for advanced learning. It also provides a good explanation of the underlying physical principles of each application being considered to give the beginner a good grasp of this technology."